Overview - A French comedy master whose films went unseen for decades as a result of legal tangles, director-actor Pierre Etaix is a treasure the cinematic world has rediscovered and taken up with relish. His work can be placed in the spectrum of classic physical comedy with that of Jacques Tati and Jerry Lewis, but it also stands alone. 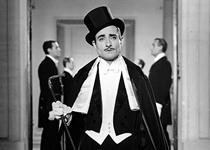 These films, influenced by Etaix’s experiences as a circus acrobat and clown and by the silent film comedies he adored, are elegantly deadpan, but as an on-screen presence, Etaix radiates warmth. This collection includes all of his films, including five features, The Suitor (1962), Yoyo (1965), As Long as You’ve Got Your Health (1966), Le grand amour (1969), and Land of Milk and Honey (1971)—most of them collaborations with the great screenwriter Jean-Claude Carrière—and three shorts, Rupture (1961), the Oscar-winning Happy Anniversary (1962), and Feeling Good (1966). Not one of these is anything less than a bracing and witty delight. Sophisticated silliness. I think that might be the best way to describe the films of Pierre Etaix. Inspired by the masters of silent cinema and the physical comedy of vaudeville, the French director/professional clown was responsible for a charming string of slapstick movies throughout the 1960s. Unfortunately, due to legal conflicts, his body of work has remained largely unseen for many years. That is, until now. 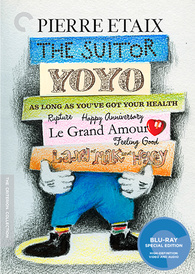 With this collection, Criterion presents the brunt of Etaix's filmography, including five features, 'The Suitor,' 'Yoyo,' 'As Long as You've Got Your Health,' 'Le grand amour,' and 'Land of Milk and Honey,' and three shorts, 'Rupture,' 'Happy Anniversary,' and 'Feeling Good.' An exuberant feast of deadpan absurdity and endearing wit, these movies reveal a marvelous artistic talent marked by a unique brand of refined goofiness that masks an intricate cinematic design beneath blissful narrative simplicity. Etaix's initial foray into cinema comes in the form of his 1961 short film, 'Rupture.' Marking the first of many collaborations with celebrated screenwriter Jean-Claude Carriere (who also shares co-directing credit here), the story focuses on the deceptively simple tale of a man (Pierre Etaix) who attempts to respond to a Dear John letter he has received from his girlfriend. What follows is a carefully orchestrated descent into slapstick farce where everything that possibly can go wrong does. Exaggerated mishaps with his pen lead to further complications with his desk and just about every other object in the room, creating a humorously hostile world that almost seems to have a personal vendetta against our lovably hopeless hero -- a concept that will go on to define much of the director's work. In his follow-up, the Academy Award winning 'Happy Anniversary,' Etaix expands his style to a slightly more ambitious scope. The plot chronicles a husband (Pierre Etaix) who frantically tries to complete a series of errands for his anniversary, while his wife (Laurence Lignières) waits for him at home with a romantic meal already prepared. Of course, these errands turn out to be increasingly difficult to complete as Etaix's unlucky alter ego runs into repeated exaggerated complications mostly dealing with impossible parking and traffic. More clever visual gags, vaudeville acrobatics, and concentrated physical comedy mayhem abound. The last short, titled 'Feeling Good,' was originally one of the vignettes included in the director's anthology feature 'As Long as You've Got Your Health,' but was later replaced with another short when Etaix was given the opportunity to re-work and re-release that film. In this comical misadventure, a man (Pierre Etaix) attempts to enjoy a camping trip out in the peaceful wilderness -- but, as one might expect, he runs into a few issues, leading to a series of silly accidents. Eventually the man is forced into a satirically larger-than-life camping ground (fenced off like a prison) where he meets more bizarre characters and attempts to escape. As a performer, Etaix is simply marvelous throughout all the shorts, effortlessly channeling the likes of Buster Keaton and Charlie Chaplin into a hapless, good-natured persona all his own. Heavily influenced by silent cinema, the films feature very sparse dialogue, and instead the director mostly relies on images alone to elicit laughter, drawing potent comedy from complicated physical bits, facial expressions, and reactions. While the narratives are exceedingly straightforward, the visual gags prove to be very clever, entertaining, and painstakingly executed, revealing boundless creativity and an impressive command of tone, timing, editing, deliberate sound design, and slapstick imagination -- all elements that are further developed to great success in his feature length efforts. A charming, deadpan exercise in understated buffoonery, 'The Suitor' is the director's first feature length effort, and quite possibly his most enjoyable. We follow Pierre (Pierre Etaix), a shy, socially awkward bachelor whose parents pressure him into finding a wife. Sadly, wooing women is not Pierre's strong point, and his earnest efforts are repeatedly dashed by disastrous and often hilarious results. The situation grows further complicated when the unfortunate suitor becomes obsessed with a glamorous singer (France Arnel). Now madly in love, he'll stop at nothing to win her heart. Filled with an abundant collection of subtly escalating comical situations, the film is fueled by a dry physical absurdity and a delicate goofiness that are delightfully infectious. Pierre's various attempts to pick up women start out fairly innocuous, but every action he takes somehow backfires thanks to poor timing or exceedingly silly misunderstandings. Just as established in the director's shorts, it often seems as if the world itself is working against our protagonist, and in an overtly absurdist twist, several objects will literally break apart when he tries to use them. Like a carefully laid out stack of dominoes, Etaix constructs a series of gags set off by seemingly simple tasks that somehow become extraordinarily complex, slowly building visual jokes upon jokes all at the expense of his character's amusing ineptitude. Highlights include an imaginary date that almost burns down a house, a few ridiculous stabs at flirting in a restaurant/club, and Pierre's well-meaning attempts to get a drunken, passed out woman home. Throughout it all, Etaix takes his time with the pace, gradually establishing a comedic rhythm that, in stark contrast to many modern efforts, actually requires some patience and attention from its viewers. Perhaps the most simple and light-hearted of his features, 'The Suitor' is also one of my favorites. Taking its cue from the works of Federico Fellini and Pierre Etaix's own experiences in the circus, the director's sophomore feature, 'Yoyo,' chronicles the life of a millionaire turned clown, and later his son, a famous clown who eventually becomes a millionaire (both played by the filmmaker). A bittersweet, cyclical examination of happiness and dreams, the film examines the pitfalls of wealth with all of Etaix's trademark wit and heartfelt affection. Starting out in 1925, the movie begins with a loving homage to silent filmmaking, complete with sped up motion and no dialogue. As we skip ahead through time, the style eases into a more traditional approach, taking us through the depression, war, and beyond as the title character rises toward clown stardom. Leisurely paced and packed with childlike curiosity, the movie exposes the emptiness of superficial success and the joys of uncomplicated wonder. A few little hints of the surreal even pop up, helping to fuel the film's beautifully realized final images, adding a touch of whimsy to the already enchanting experience. While all of Etaix's films rely on episodic structures, the director takes this concept to a much more literal level in his third picture, an anthology feature titled 'As Long as You've Got Your Health.' A collection of four shorts starring Etaix, the movie offers more slapstick humor and creative wit, furthering many of the same themes and sensibilities defined by the comedian's previous work. The first vignette focuses on a man reading a vampire story in bed, periodically shifting to the world within the book as he imagines the plot play out. The second short deals with a humorous trip to a crowded movie theater and also features a satirical jab at commercials and consumerism. In the third segment, construction and traffic cause one man so much stress that he is prescribed medication, leading to a comical mishap at a restaurant. In the final chapter, a couple's trip to the woods for a picnic is complicated by an inept hunter. Though the most uneven of the films in this collection, the movie is still very worthwhile, and each vignette has at least a few shining moments. Several of the gags in the first sketch, directly tying the on-screen reader's emotions and actions to the imaginary world of the book he's reading, are particularly clever, and the commercial parody in the second segment is incredibly sharp and imaginative. While some of Etaix's physical shenanigans start to feel a bit redundant, he provides enough twists on his usual routine to make the material seem fresh -- and as always, he sells each slapstick bit with such affable dedication that it's hard not to smile whenever he's on screen. In his fourth feature, 'Le grand amour,' the director places his emphasis on a married man, Pierre (Pierre Etaix), who becomes infatuated with his new beautiful assistant (Nicole Calfan). Bored with the dull complacency of domesticity and reinvigorated by his newfound passion, Pierre becomes torn between his loyalty to his wife (Annie Fratellini, Etaix' real life spouse) and his burgeoning obsession with his young subordinate. As he continues to fantasize about having a love affair, he tries to summon up the strength to either give up his dreams of infidelity or finally act out upon them. One of Etaix's most stylistically creative efforts, the film features several overtly surreal touches and a slightly self aware sense of humor, all used to enhance the potent comedic sensibilities already developed throughout his career. Memory and perception are playfully toyed with, particularly in an entertaining sequence that focuses on the escalation of town gossip. First we are shown a harmless scene where Pierre is strolling through town and innocently greets a woman he passes by. Next, we are shown the same scene slightly exaggerated from the perspective of a town gossip recounting the story to her friend. The story keeps getting told from gossiping woman to gossiping woman and like a cinematic game of telephone, each new recital becomes more and more scandalous until what once was a simple hello becomes a full on romantic tryst in the bushes. This fanciful imagination carries on throughout the runtime, informing several fantasy sequences, including an amusing hypothetical divorce scenario where every object in the couple's home is literally severed in two. The real highlight here, however, has to be a brilliantly realized dream scene that follows Pierre and his young assistant on a peaceful excursion through slumber land, where their bed acts like an actual car. On their journey they run into more mattress driving motorists and Etaix milks the visual metaphor for all it's worth, going so far as to have broken-down beds lying on the side of the road, and at one point two beds even crash into each other, causing a minor explosion. The whole sequence is brimming with surreal imagination, gleeful wit, and impressive technical wizardy, making it one of the director's most inspired accomplishments. Eschewing the scripted narratives of his previous work, Etaix's final film, 'Land of Milk and Honey,' is actually an experimental satirical documentary -- one that proved to be a little controversial when first released. In fact, its negative reception was a key factor in prematurely ending the director's film career. Shot in the wake of the May 1968 strikes and protests that swept across France, the film chronicles the Europe I Podium radio tour that traveled throughout the county's vacation spots providing entertainment and contests. Through a deliberate hodgepodge of carefully edited pieces, Etaix draws slyly satirical connections between the images he shows and the voice-over interview snippets he includes, depicting the country's transition toward complacency and consumerism. Clips of terrible amateur singers, sunbathing beach-goers, and camping vacationers are all fused with audio recordings of the participants discussing numerous heady topics and social issues of the day, touching upon eroticism, violence, cinema, advertising, woman's rights, TV, and even the moon landing. Through these audio/visual parallels (sometimes blatant, sometimes almost subliminal), the director creates an interesting, often humorous commentary, that while critical and biting, is never quite mean-spirited. Though completely different than any of his previous films, the manner in which Etaix approaches the material still bears certain similarities, with the editing taking on the same careful construction as his intricately planned slapstick gags. While audiences and critics didn’t take kindly to its satirical jabs at the time of release, the film now serves as an interesting (and humorous) document of French society during an important transitional period. Utterly captivating and playfully amusing, the films of Piette Etaix are pure comedic gems. It's a shame that these movies have been unavailable for so long, but thankfully this collection will bring the director's work to a larger audience. Etaix's style takes elements of Keaton, Chaplin, Tati, and Fellini to form a truly singular comedic voice and irresistible on-screen personality. Despite the occasional larger-than-life embellishments, there is a delicate, almost understated sense of cinematic craft here, blending simple storytelling with potent visual gags. Filled with constant misunderstandings, clumsy maneuverings, physical mishaps, and inexplicably breakable objects, Etaix's work plays out like an absurdist examination of Murphy's Law specifically designed to frustrate and deflate his protagonists at every opportunity -- all to the grinning delight of his audience. Criterion presents 'Pierre Etaix' in a foldout case held within an outer cardboard slipcase with spine number 655. All five features, three shorts, and supplements are spread out over two BD-50 discs. Disc one holds 'Rupture,' 'Happy Anniversary,' 'The Suitor,' and 'Yoyo.' Disc two contains 'As Long as You've Got Your Health,' 'Feeling Good,' 'Le grand amour,' and 'Land of Milk and Honey.' A booklet featuring an essay by film critic David Cairns is also included. All eight films feature new digital masters sourced from the 2010 restoration of Etaix's work and are presented here with 1080p/AVC MPEG-4 encodes. The majority of the movies are in black and white, but 'Le grand amour,' 'Land of Milk and Honey,' and brief portions of 'As Long as You've Got Your Health' are in color. All of the films are framed in the 1.66:1 aspect ratio with the exception of 'Rupture' and 'Happy Anniversary' which are in the 1.33:1 aspect ratio. The included booklet details the intricate restoration process in depth, and thankfully the results are really quite impressive. For the most part, all of the films feature comparably high quality transfers with only very minor differences. With that said, some might be alarmed that Criterion has decided to spread the five features, three shorts, and supplements across only two discs, and while this limited space has little effect on the majority of the films, there appears to be one very minor exception (more on that below). The restored print is in great shape with virtually no signs of damage outside of a few blink and you'll miss them specks and vertical lines. A moderate to heavy layer of grain adds some nice, filmic texture to the image, but there are a few odd shots here and there that appear a tad noisy. Detail and dimension are rather strong throughout, though some shots can be a little on the soft side. Contrast is high with slightly blooming whites that give off a faintly dreamy glow. Blacks are mostly deep and inky, though they do appear a tad elevated in some nighttime sequences and there is some occasional pulsing. This transfer is very much in line with 'The Suitor,' providing similar print condition, detail, and dimension. Contrast is less intense here, however, offering a slightly more balanced and natural looking grayscale. With that said, there are a few scenes that offer a faintly blurry quality, but thankfully this is not the norm. While image quality here is very similar to the two previous films, there is one segment where the space limitation does appear to have a small negative effect. Around the 08:08 mark in the first segment titled 'Insomnia,' some unsightly false contouring/posterization becomes visible in the dark, shadowy portions of the screen, offering an unappealing, compressed appearance that does not seem to be inherent to the source. Thankfully, this artifacting is very brief and appears to be isolated to this one instance. The first of Etaix's films completely shot in color, 'Le grand amour' looks quite lovely in high definition. Clarity is nicely resolved and saturation is very pleasing. Contrast is also well balanced with consistent whites and blacks. The only real drawbacks to the image involve some minor flicker and a few quick shots that look like they've been taken from a different generation source. Filmed in 16mm, Etaix's final feature is the roughest looking movie in the bunch, but still appears faithful to its source. Grain is the heaviest here, and detail and dimension are the least impressive, offering a flatter, softer look. Saturation is natural and contrast and black levels are problem free. Though they seem to feature slightly lighter grain structures (and 'Rupture' is a little rough), the remaining short films are all comparable to the black and white features, with no major technical issues to speak of, offering a faithful and natural looking presentation. The feature length movies are presented with French LPCM mono tracks and the shorts are paired with French Dolby Digital 1.0 tracks. Optional English subtitles are also included. While there are some minor differences between the quality of the various mixes, for the most part they all sound very similar, and together offer a modest but faithful audio experience. The sparse dialogue is clear, clean, and relatively full throughout each of the films, but there can be a very faint echoey quality to some speech, particularly in 'The Suitor' and 'Yoyo.' The earlier movies are a little on the flat side, but dynamic range opens up on 'As Long as You've Got Your Health,' and 'Le grand amour.' Sound design is essential to all of these films as Etaix often enhances his comedy through specific exaggerated effects and music cues. Thankfully, these mixes preserve all this creativity beautifully. As was the case with the video, 'Land of Milk and Honey' also features the roughest audio mix, exposing some of the inherent limitations of the documentary recordings. With that said, notable pops, crackles, and background hissing are thankfully absent from the rest of the films. Respectfully restored, these audio mixes are quite nice. Sound plays an integral part in the films' humor, and all the simple but imaginative effects work and music are highlighted without any major technical issues. Criterion has put together a relatively slim but very worthwhile collection of supplements, including director introductions and a documentary on the filmmaker. All of the special features are presented in 1080p with French Dolby Digital 1.0 audio and optional English subtitles. Pierre Etaix Introductions (HD) - The director provides newly recorded introductions for 'Rupture' & 'Happy Anniversary' (5 min), 'The Suitor' (4 min), 'Yoyo' (5 min), 'As Long as You've Got Your Health' (4 min), 'Le grand amour' (6 min), and 'Land of Milk and Honey' (6 min), describing each project's genesis, influences, challenges, and their reception upon release. Pierre Etaix, un destin anime (HD, 1 hr) - This is a 2011 documentary about Etaix that features recent interviews with the director and his various collaborators. Etaix's life-long love of the circus and slapstick comedy is highlighted, and his path toward becoming a clown and filmmaker is recounted in detail. The participants also provide entertaining anecdotes about Etaix's comedic style and directing methods, and there are lots of amusing and enlightening tidbits related to the films' productions shared throughout. The films of 'Pierre Etaix' are a treasure trove of slapstick delights. With five features and three shorts, this is a great collection from Criterion that offers all of the director's major works. With the exception of a few minor issues and a very brief instance of artifacting, the video transfers are strong, and though modest, the audio mixes are faithful and free of any major technical concerns. Supplements are limited to director introductions and a single documentary, but the material provided is packed with interesting information and insights into Etaix's comedic style. Finally available after years of legal conflicts, these films really are quite special and while the style of humor won't appeal to everyone, big fans of physical comedy (especially lovers of Buster Keaton and Charlie Chaplin) should not hesitate to seek this out. Recommended.